Each year in what has become a society calendar date to watch, the Starlight Five Chefs Dinner is held to raise funds to support the Starlight Children's Foundation. This year the dinner was held on the 27th August at the InterContinental Adelaide. Five of Australia's best chefs including Soon Young Kwon from Bar Torino, Chianti, James Brinklow from The Lane Vineyard, Tony Hart from the InterContinental Adelaide, Stuart Oldfield from Made Catering and Jack Ingram from Southern Ocean Lodge, Kangaroo Island each prepared a course, matching all with the finest wines to present a spectacular five course degustation. This year Le Cordon Bleu Adelaide students had the opportunity to participate both in the kitchen and in front of house service during the event. Opening the door to a fantastic learning experience to be had. 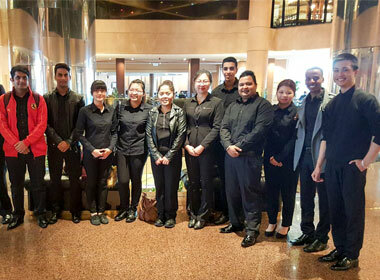 Well done to each of the student show participated including Ken Salim, Noeme Eloma, Hauke Krause, Marcus Tan, Kirra Wu, Viktor Zhang, Charles Leung and Bekzhan Kabylzhanov in the kitchen. Huang, Minea Chhim, Aviva David Ashtamkar, Rebecca Jiang, Apoorv Nagpaul, Vu Doan Trang (Michelle) Pham, Saghar Ajeeth Jagavkaar, Thi Bach Mai (Ami) Nguyen, Sarabmeet Singh (Sarab) Sandhu, Neeraj Kumar, Gita Thapa and Varunbir Singh (Varun) Thind. A big congratulations to all who participated.